I touched on this before, but part of what makes Christopher Nolan's Batman-telling so powerful is that somehow he can make the "comical" characters suddenly become psychologically believable and scary. Back in August, I compared Heath Ledger's portrayal of the Joker to Bruce Ivins, the leading suspect in the Anthrax case from 2001, who committed suicide earlier this year. The New York Times ran a story about Ivins that has stirred up more and more disturbing details. One of the most disturbing Ivins details is a 2004 Photo (pictured left). This "Happy Holidays" picture was sent out to his bio defense colleagues in e-mail. 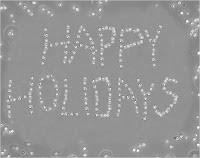 The Words Happy Holidays are actually made of Anthrax spores. If Bruce Ivins is the Anthrax killer has alleged this type of bioterrorism "comedy" suddenly takes on a new level of sickness...Anthrax killer in 2001, Anthrax joker in 2004. I'm not sure what to make of this connection, but the fact of the matter is that somehow I think Christopher Nolan and Heath Ledger taped into this type of psychological and criminal behavior, that goes beyond the comics into absurd reality. Ivins happy holidays pictures among other images can be found at this link from The New York Times: A Troubled Life and a Mysterious Case. The Words Happy Holidays are actually made of Anthrax spores. I just saw Dark Knight. I agree that they have made the characters much more believable than previous versions. And in cases where they go beyond the believable, they seem to be aware of it and just ask the audience to buy into it. Audience: "How did the Joker surgically implant a cell phone inside a man?" Filmmakers: "Ummm... he's just awesomely evil okay!? "